Established in 1960, Fabdec, based in Shropshire, have worked increasingly hard to become a leading manufacturer of stainless steel fabricated products and agricultural equipment. With a reputation for quality, Fabdec have grown into a primary name in heat transfer technology and have also established themselves to be a market leader in bulk mill tank design with an ongoing dedication to customer service and excellence throughout. Serving markets within the UK as well as the rest of the world, Fabdec provides a service that can only be described as exceptional and serves clients such as; the Dairy Industry, the Brewing Industry, Food Processing Companies, Pharmaceutical Businesses, Water Heating and Refrigeration firms and Heat Recovery customers. Fabdec delivers the ultimate in milk cooling technology and offers an impressive range of supreme quality products; to serve the dairy farmer in every phase required in the milk cooling process. We have a superb choice of milk cooling systems from pre-cooling systems such as plate coolers and ice builders, right through to bulk milk tanks and heat recovery systems. 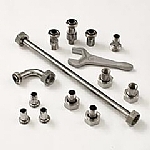 Featuring state-of-the-art technology and utilising over 50 years of experience obtained in stainless steel fabrication and heat transfer technology, our customers can be assured that our products will surpass their expectations. Fabdec’s selection of modular milk cooling systems utilise the very latest technology to ensure that the milking parlour runs both efficiently and cost effectively. We are able to tailor our systems to meet the needs of the individual farm and work concurrently with the parlour system already in place. Our modular systems are based on Free Flow, an infra red sensor technology, instead of the traditional ‘fill and tip’ mechanism, which offers a completely reliable, maintenance free solution. As the modules can be installed and operated independently they are ideal for implementing a measured and controlled way of technically upgrading a farm. 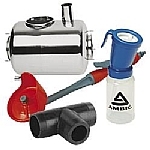 For spare and parts for milking and milk cooling processes, Fabdec stock a vast range of products from leading manufactures DARI-KOOL, for tank spares and KINGSTON for parlour spares. We are able to assist with all your spares and parts enquiries and we will advise on the best solution for your milking and cooling problems, simply contact us either by phone or email. •Heatime- Stand-Alone Heat Detection System. •Heatime Horizon - Stand-Alone Heat Detection using Long Distance Technology. •Heatime Health - 4 in 1 - the ultimate tag. •Heatime Excell - Effective PC-based Cow Management Systems for Large Herds. •Heatime Vocal - Integrated Fertility and Rumination Data System. •Heatime DataFlow- Complete Milking and Herd Management System. •Heatime Sort-Gate - Cow Management Sorting Systems. Fabdec supply Excelsior Unvented Water Heaters, a market leader in their field for efficiency and level of performance. Designed and manufactured in Britain, the Excelsior range only features high quality components and retains its original design ethic at all times. Excelsior Unvented Water Heaters can be used for both commercial and domestic use, with home heaters available in capacities of 80 – 305 litres. For commercial use, heaters can be made to order in up to a 4000 litre capacity, with buffer vessels also being available in up to 32,000 litres. The SMART-HEAT Heat Recovery System is a revolutionary way to turn heat from refrigeration circuits that is usually just wasted, into hot water. SMART-HEAT is both environmentally friendly and will reduce your overall energy costs. As there are no moving parts, SMART-HEAT is also maintenance free and complies with all British and European Standards. Made from duplex stainless steel, the range comes in sizes from 220 to 2,000 litres with the option to connect up to six condensing unit to a single SMART-HEAT. There have already been over 100,000 installations and that number is growing every day. 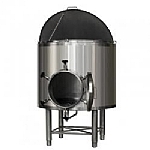 Fabdec have a comprehensive selection of spare parts and accessories that are suitable for the brewing process, with spares for the cooling, milking and brewery. 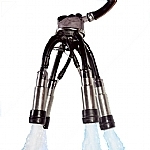 We can provide stainless steel fitting, water solenoid valves, tubing and connectors to meet all of our customers’ needs. We have a webshop which carries our complete range of products that are available to purchase online and should you not be able to find what you are looking for, please don’t hesitate to contact us and we will be happy to help. If you've any questions about Fabdec Ltd products or services feel free to ask them here. Excelsior Unvented domestic water heaters is available in seven cylinder sizes, ranging from 80 litres to 305 litres, so there's a size suitable for every home.